A collection of fossils described as a breakthrough in the study of evolution is set to be unveiled. The fossils, discovered in the Borders, are going on display at the National Museum of Scotland in Edinburgh. The find is said to unearth a "missing chapter" of the evolution story and overturn a long-held theory about evolution on Earth. Scientist and broadcaster Sir David Attenborough described the discovery as "wonderful and exciting". Romer's Gap, named after the American palaeontologist Alfred Sherwood Romer, is a gap in the fossil record, showing little evidence of life on land between around 345 and 360 million years ago. The gap led some palaeontologists to conclude that there were low levels of oxygen during that time, which limited evolution on land. However, the newly-unveiled fossils suggest that a wide diversity of amphibians, plants, fish and invertebrates all existed during the 15 million-year period and are said to shed light on a period that previously had been almost blank. The fossils were unearthed by palaeontologist Stan Wood following a 20-year search. 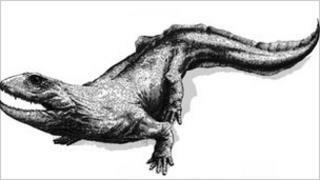 One notable amphibian specimen has been nicknamed Ribbo due to its prominent and well-preserved vertebrate structure. It has provided scientists with enough information to interpret what the creature may have looked like as it roamed the Tweed basin around 350 million years ago. Nick Fraser, keeper of natural sciences at National Museums Scotland, said: "This is a real 'eureka' moment in palaeontology. "These fossils aren't much to look at in and of themselves, but they may prove to be profoundly important in advancing our understanding of the earliest development of land-dwelling life as we know it today. "For that reason, we are tremendously excited to be able to give people the chance to see these fascinating objects first-hand." Evolution's Missing Chapter runs from Tuesday until 29 April. Sir David Attenborough said: "One is accustomed these days to hear of sensational new fossil finds being made in (other) parts of the world. "But to learn of a site in this country, which must surely be counted among the most extensively explored, in geological terms, is wonderful and exciting."